Inicio » Sin categorizar » What to see in Valencia? Located between Castellon and Alicante, Valencia is the capital of the Valencian Community. 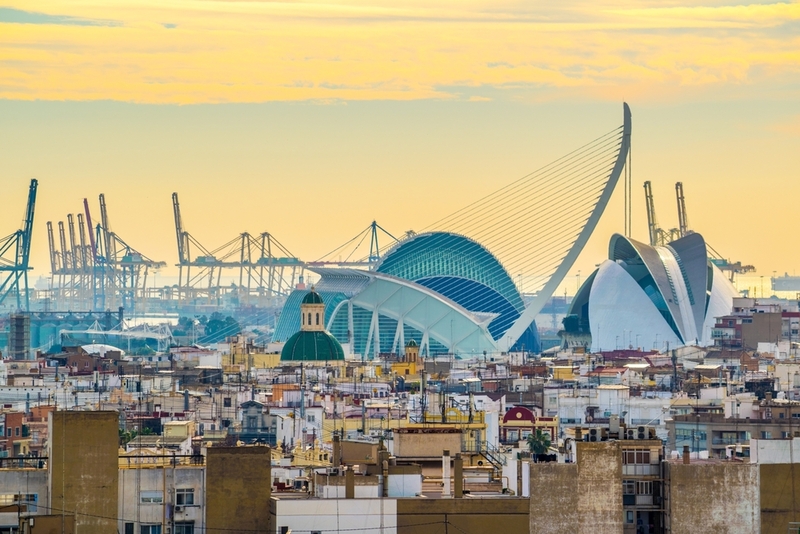 Situated on the east coast of Spain, Valencia has approximately 786,424 inhabitants. Designed by Valencian architect Santiago Calatrava, it is the most famous and representative building of Valencia; a group of science and biology museums, concert halls and modern gardens. One of the museums that make up this complex is the Oceanogràfic which is considered one of the largest aquariums in Europe. You can enjoy a variety of marine species from around the world, birds of exotic origin and dolphin shows. Distinct from traditional Valencia, in this place you will be surprised by the modern look of the buildings and the spaciousness and relaxed atmosphere to be enjoyed. The Albufera Park in Valencia is just 11 km from the centre and forms part of the SPA, Special Protection Area for Birds. You can visit the place by bike, on foot or on one of the guided tourist boats. If you do, we recommend you go in the afternoon and stay to enjoy the sunset from the pier while surrounded by nature; you will be in harmony, and you will feel so relaxed you will not want to leave. One of the most famous beaches in Valencia, perhaps because of the peculiarity that it is very close to the city centre, 6 or 7 Km away. It’s a large and busy area and, depending on the time you go, you can stop for refreshment in bars, restaurants or pubs. Numerous palm trees and lots of people doing sports such as fishing and swimming… I love strolling along the promenade and enjoying the atmosphere. Valencia Cathedral, known as the Cathedral of Santa Maria, is located in the heart of the city. What is most striking is its 51 meters high bell tower, and its 207 steps. Inside the cathedral you will see the first Renaissance paintings, which remain in Spain, located in the Main Chapel. The Chapel of the Holy Grail and the Chapel of San Francisco de Borja are also recommended as they retain original paintings by Goya.